by Gary Small & the Coyote' Bros. If you love the music traditions of Bob Marley, Carlos Santana, and War, you will love Gary's newest release. Music that the whole world understands yet coming from the Native American perspective. "Having played over the years with a 'legend', namely Carlos Santana, I can truly say that Gary brings to mind not only that caliber of ability, but also the same depth of spirituality and commitment to his art that is the hallmark of great talent." Graham Lear, Veteran Drummer for Santana for over a decade. 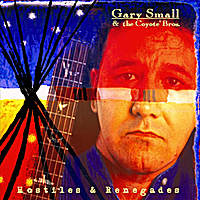 This is the newest "Native Americana" release from the multi-winning Native American Music Awards recording artist, Gary Small. The music is seeped in Native American culture whether it a tribute to his ancestors or his fellow Native brothers and sisters of today. Small states that music is to be shared and therefore a musician should learn many styles and form that knowledge into his own statement. Small difinitely succeeds here. All his influences are here in this recording whether its in his soulful voice or singing melodic guitar work. This album will not disapoint.